Bomber jackets are basically everywhere right now and everyone seems to be obsessed with them, including myself. They’re effortlessly cool and casual and seem to work with anything. There are so many amazing ones available at the moment on the high street. I’ve been struggling as there are so many I want and don’t know how to begin picking a favourite. So, with that in mind, I thought I’d do something a little different today. I thought I would share with you a selection of some of the ones I’m loving and currently pining after. As is typically the case, I’m attracted to this one because of how unique the colour is. I think it’s really rather special. I always seem to be drawn to the unexpected and pieces that are different and stand out. The trouble is that I then have a nightmare styling them and working them in with the rest of my wardrobe. This is such a gorgeous colour though and seems like it would work well with a lot of looks. I think it would look amazing paired with some 70s inspired pieces. The shiny fabric looks great and I feel the colour makes it an unexpected choice for spring, which I like. I’m in love with floral embroidery at the moment (you can see my post featuring the most incredible floral embroidered jeans here). I think the colour palette of this jacket is lovely. The soft, pale colours are perfect for the spring time and make this a dreamy option. Everywhere has great classic khaki bombers, and it’s the classic colour of bomber jacket for a reason. I love this particular one from New Look because of its cropped length which I really like. It’s also available in navy which is equally gorgeous. This Asos pink and black satin jacket with the prettiest embroidery is probably my favourite. I told you I have a thing for floral embroidery, and it seems to mix perfectly with the casualness of a bomber jacket. Perhaps it shouldn’t work, and maybe to some people it doesn’t, but to me the contrasting aesthetics go together beautifully. Plus, I think the use of pink is probably what puts this one ahead of the rest for me. Whenever I see a pink bomber, I immediately think of Grease’s pink ladies! Yet again I think what I really love about this Topshop one is its unique colour. I’ve seen this several times in store (and drool over it every time and wish I could afford it), and it’s a difficult colour to describe and capture in photos. It’s a very pale, creamy peachy kind of shade. I’m also a huge fan of the contrasting black used at the hem and cuffs and the MA1 style. The sateen fabric is beautiful and I personally think it’s the coolest out of my picks. Using suedette for a bomber jacket is a really nice twist. There are a few good suede and suedette ones around, but I chose this as my favourite because of it being black. The classic colour and alternative material make it a different choice and I feel like it would work well for evening and more dressed up looks. But it still has that casual silhouette making it day time appropriate too. And it’s so affordable. Boohoo is great if you’re looking for a more affordable bomber as they have quite a large selection and there are some gorgeous ones. I definitely recommend you check them out. 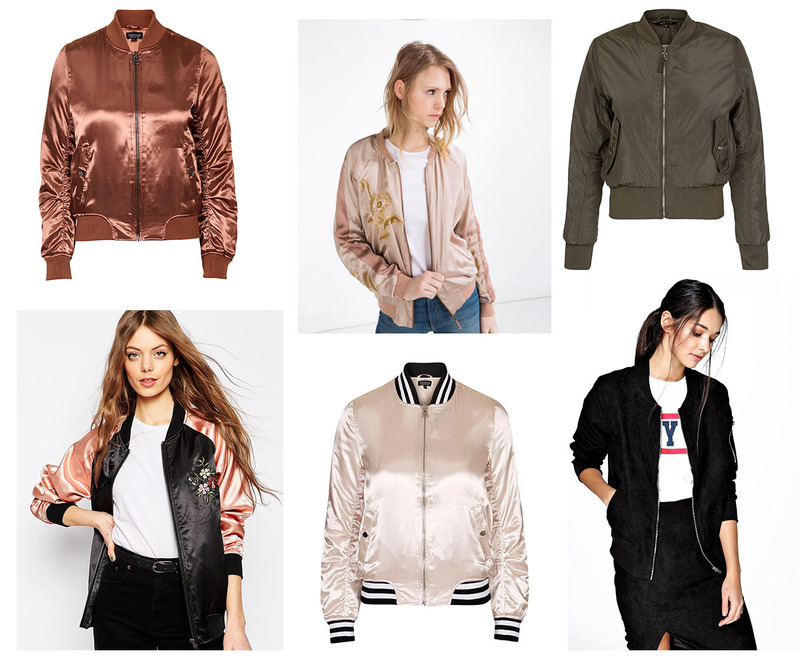 So, there you have it: a little round up of my favourite bomber jackets. I haven’t done this kind of post before, I usually stick to outfit posts and beauty reviews. I’m thinking of starting to incorporate more of these ‘wish list’ compilations though so please let me know if it’s something you’d like to see more of. It’s also my first time creating a collage so apologies it’s not that great. I’m learning. I love this kind of post, definitely up for more of those! Love the bomber, such a cool style and so many ways to combine them. My favourite is when paired with a feminine dress, to play with the border between masculine and feminine. Don't own one myself but definitely thinking about getting myself an awesome bomber soon! I like the Asos... so girly! Great post, I love the pink topshop one! I think your blog is lovely, let me know if you would like to follow each other! I haven't worn a bomber jacket since my primary school uniform! But could totally see myself wearing the Asos floral one :P Great wrap up of jackets! I have the Topshop bomber jacket! It's fantastic! These jackets are perfect! I love the silky detail of the light pink one. Perfect picks!